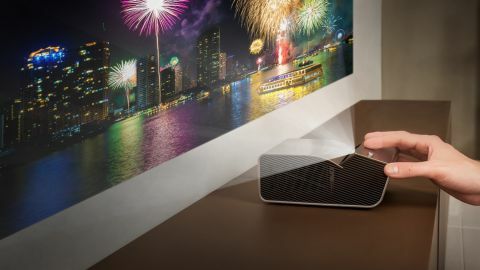 In many ways, the LG PH450UG represents a new wave in portable projectors. Offering excellent wired and wireless connectivity, not to mention a solid picture for the price, it’s a great way to bring big screen entertainment to smaller spaces. If you want big screen home entertainment but don’t have the space, or funds for a large flatpanel TV or home cinema projector, then LG’s DLP LED Minibeam PH450UG Ultra Short Throw (UST) could be the answer. It needs only a dozen centimetres or so to cast a huge image onto a white wall or screen and, even better, it’s also ridiculously compact and relatively affordable at $650 (£529, around AU$864). There is a catch of course. The PH450UG has a resolution of just 720p. If you need more, LG has the PF1000U, a slightly larger 1080p UST model, that sells for $1,399 (£999). There are other projectors in this price range capable of 1080p – like the class-leading BenQ HT670 – but if you’re committed to the small form factor, the PH450UG is the way to go. The PH450UG measures just 132 x 200 x 80.5mm (W x H x D), and weighs only 1.1kg. It’s more compact than most projectors in its weight class, but also one of the brightest as well at 1,450 ANSI lumens. None of this compromises its contrast, which is rated at 10,000:1. Its small stature makes sense because it’s also fully portable, thanks to a built-in battery which runs for around 2.5 hours when fully charged. Connections include a single HDMI, which is also MHL enabled for smartphone use, and a USB reader. Focus is manual, via a thumbwheel. There’s also a mini headphone jack if you want a bit of privacy while watching your favorite flick. Of course, you’re not limited to hardwiring sources. You can also mirror a compatible device using Screen Share (using Miracast or WiDi). Screen casting from a mobile is a great way to share stills, but you can also mirror video apps. Unfortunately we experienced a sync issue between video and audio which rules out using the function for a Luke Cage catch-up. The PH450UG boasts an integrated sound system, but with just two 1-watt speakers it’s not going to attract anyone’s attention. That said its less-than-formidable speaker configuration really doesn’t matter, as the projector also has Bluetooth. You can pair it with wireless BT speakers of your choice, or use it with Bluetooth headphones. The projector is also 3D-ready, although no 3D glasses are supplied in the box. Set up is a doddle. Just position the projector in front of a white wall and then sharpen up the image. You can dictate the size of the picture by moving the projector back and forth. From a mere 7.5cm you’ll get a 40-inch image. Move back to 16cm or so and you’ll have a 50-inch display. If you have the space, you can push this much further. At 60cm or thereabouts you’ll get a massive 132-inch cinema image. Although you can stretch the image out to this extreme, you might not want to as this model is limited to 720p resolution and clarity begins to suffer when you fill up that wall. The only on-body control is a fiddly joystick D-pad. Given that you get an IR remote in the box, which is almost as big as the projector itself, you probably won’t need to use this much thankfully. The PH450UG sports a tile-based user interface, comparable with what you might expect to find on an LG Blu-ray player. To simplify navigation and menu access there’s a Quick Menu, which presents a wheel for key parameters. While this UI works fine on a smaller screen, it doesn’t look too elegant when upsized. The larger you make the picture, the more overbearing it becomes. Image presets include Standard, Vivid, Cinema, Sport, Game and two Expert modes. Standard is probably the best all rounder, as oversaturation seems endemic elsewhere. There are individual controls for contrast, brightness, sharpness and colour – you can even tweak dynamic contrast, as well as skin, sky and grass ‘colours’. In addition to gamma adjustment, there’s black level control and colour temperature, all standards but nice to see here too. Image quality warrants a cautious thumbs up. The LED colour palette looks great with animation, from anime to kids channel tomfoolery. Reds are deep and greens rich, making it perfect for flat-color scenes. It can look gritty with live action, though. The PH450UG struggled to distinguish noise from film grain on The Walking Dead (via Fox HD), resulting in a rather dirty looking picture. Live studio fare works better, which is good news for late-night TV fans. The screen doesn’t do a deep black, but in a darkened room there’s shadow detail and depth to its pictures. Motion resolution is predictably limited, which could undermine its appeal to gamers. Expect some screen blur with fast moving action titles – for that you'll still want a standard flatscreen. The projector offers three energy saving modes, which directly affect the brightness of the image. If you're running off a wall outlet, it pays to keep the projector on full juice. That said you’ll want to avoid using this in an area with high ambient light, as the image will wash out. One quirk of using a UST projector on a white wall is that it’ll highlight any irregularities in the surface itself, meaning smoothness becomes all important. It also proved tricky to eliminate minor keystone errors. This is a problem on other projectors but felt more acute here. That said, single chip DLP projectors have a reputation for colour fringing, but as this DLP LED doesn’t use a colour wheel that’s not an issue here. The LED light engine has an estimated life of 30,000 hours, which translates to the lifetime of the product. Finally, the integrated USB media player proves useful. It had no problem playing all the usual file types, including AVI, MPEG, MKV, WMV and MOVs. Plus, operational noise is moderate to low, measuring in at a relatively quiet 23dB in Eco Mode and 30dB in full brightness. The LG PH450UG is extremely versatile. Compact enough to take anywhere, with the option to run off the wall and the ability to throw big images in the smallest of rooms, it scratches an AV itch TVs and conventional projectors can’t reach. Moreover, picture quality is surprisingly punchy here, and Bluetooth connectivity a major boon. There’s no getting away from the fact that 720p resolution doesn’t scale that well. So while you can fill a wall with the PH450UG, it likely won’t look that great when maxed out. To be honest, serious cinephiles will grimace over some of the PH450UG’s presets, but then this projector isn’t aimed at them. This is unashamedly a gizmo for gadget lovers. This LG Minibeam model sits in something of a sweet spot when it comes to price and performance. For many, the step-up 1080p PF1000U will seem too pricey for something so patently gadgety, but here we can forgive foibles. Its compact design and ease of use should win it many friends and, as the projector doesn’t run hot, you can leave it with older kids without worry. If you want to watch movies al fresco, it’s an unbeatable option.